I don't need a history lesson on outsider music or the Shaggs, thank you. I was aware of them 25 yrs. ago. And I'm not hating on you or anyone else who cares to buy their albums. I'm not even hating on the Shaggs. I just want people to be completely honest here, the story of the Shaggs is far more interesting and endearing, and palatable than the music. Instead of explaining what makes them outside tell me how anyone can listen and enjoy any part of this album if it's all about the music and only the music as "outsider" is supposed to be. Cause if it's just the fact that they bought some instruments and recorded an album for the pure love of it anyone can do that and that doesn't make it special. Can't you learn to play your instruments and still be considered "outside"? Cause if not, then by definition anyone who picks up an instrument and plays is outsider music up to the moment they actually learn how to play. Good day sir!!! P.S. I hope you know this is all in good fun. I love music deeply and to do so I believe you have to be open to everyone's opinion and taste whether you like it or not or you completely missed the boat on the point of enjoying music and you're no longer enjoying it anymore and should stick your head in a basket of poisonous snakes of your choosing. 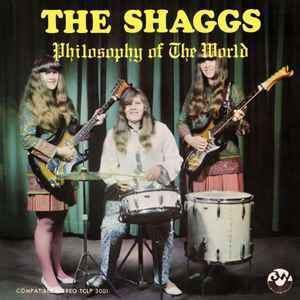 (deep breath) And I would much rather listen to the Shaggs than any top 40 billboard station any day. Believe me I get it. They still aren't any good. Don't buy this! I think Kurt and Frank were just effing with main stream media and people bought into it. Listen to the Raincoats or The Uriinals! At least they took the time to learn their instruments! Cmon. The Shaggs. Nothing like them before or after. They perfected their own oddly syncopated and detuned style. People will say it's off and people will hate.. but they are so genuine and beautiful. HORRIBLE!!!!! Don't Buy This Piece Of Shi........ . . . . Yes Oh Yes Oh Yes Oh Yes! 9000 USD!!! Oh yeah!!! Hi There, the copy I have is on black vinyl.